In Europe, maxi scooters are everywhere, and electric power is heading for the mainstream. 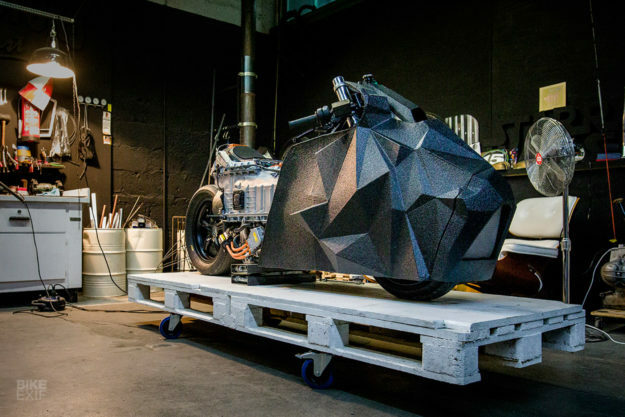 So it was only a matter of time before we saw an OEM-sanctioned custom, and here it is: a radical BMW C evolution drag bike from Rolf Reick of Krautmotors. 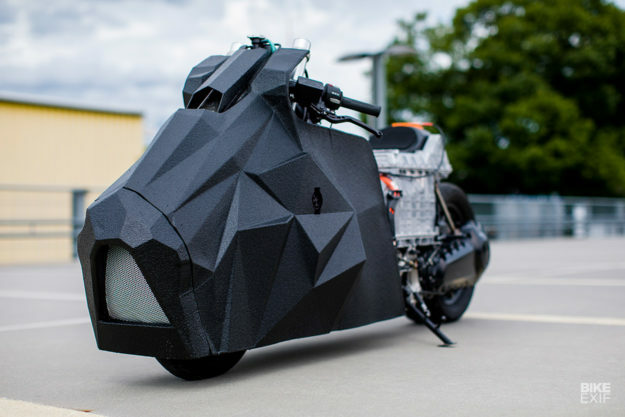 With its stealth bomber looks and low-riding stance, it’s light years away from your typical plastic-swathed step-through—and we’d put it in the Bike EXIF garage in a shot. A little background: The C evolution has been sold in Europe since 2014, and recently hit US showrooms with a sticker price of $13,750. 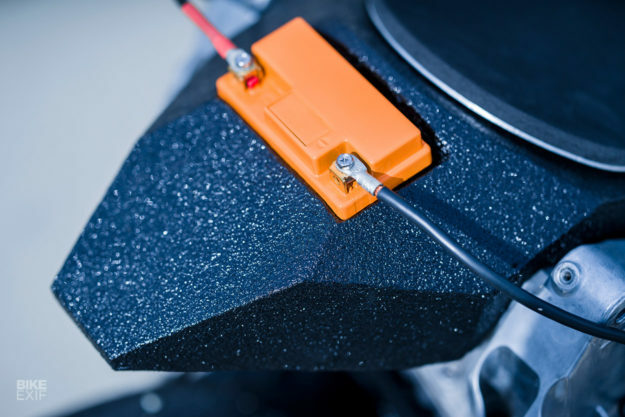 The latest version uses battery modules from the BMW i3 car and has a range of 100 miles between charges. 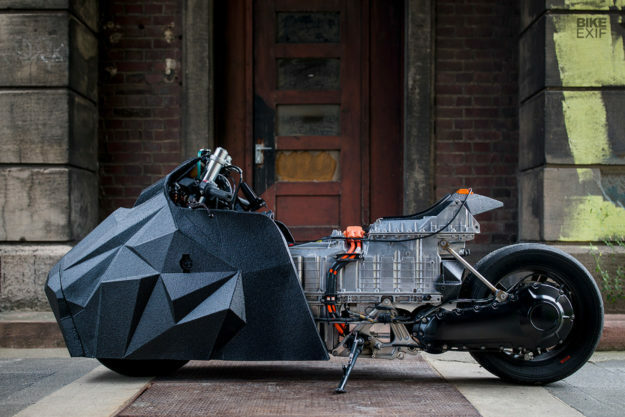 Most intriguingly, it puts out a stonking 72 Nm (about 53 ft lbs) of torque—the same as a Harley-Davidson Sportster 883, but instantaneous. It’s easy to see why BMW tapped Rolf Reick (above) for this job, and he’s delivered in spades. 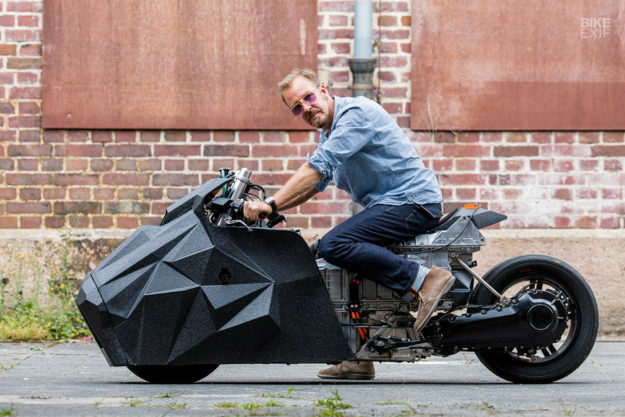 His background is in industrial design, and when he’s not building customs, he heads up a school for product design and multimedia in Mannheim. ‘E-LisaBad’ is named after Rolf’s grandmother, who strangely provided the inspiration for the styling: “I always liked her ‘Cubic’ tea service, which was designed by the Dane Erik Magnussen in the 1920s,” says Rolf. He also cites a fascination with the old Star Trek series and its ‘retro science fiction’ look. We assumed that the bodywork was a CAD exercise, but apparently it wasn’t: Rolf used good old-fashioned pen and paper, and then built up the composite material as he went along, judging by eye. The whole front end slides in on rails, and can be fitted or removed in a couple of minutes. 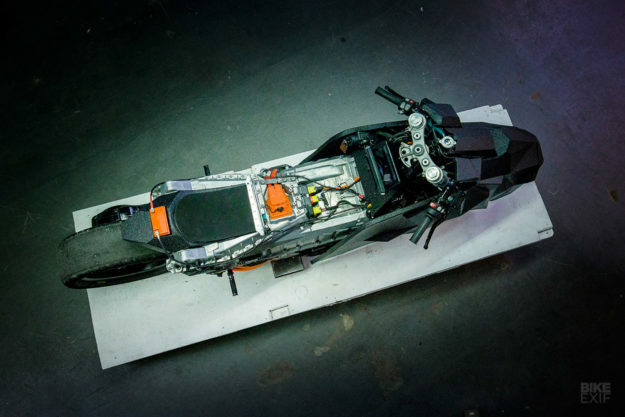 It’s substantially lighter than the 40 kilos of plastic that Rolf removed from the stock bike. The electrickery is mostly left alone. 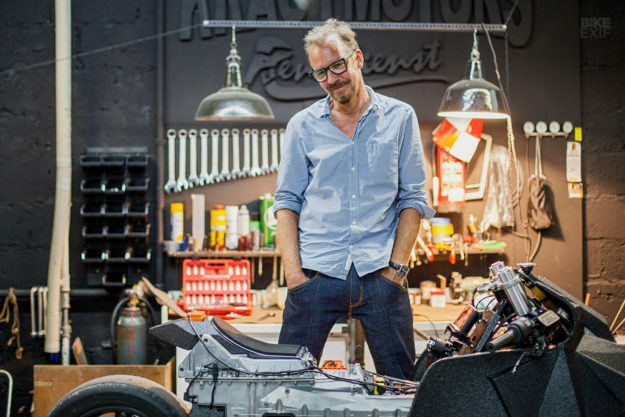 “I took an extra training course, but never touched the electronics,” says Rolf. We love the little ‘starter’ battery at the back, a discreet homage to a turbocharged Egli Kawasaki from the late 70s that had a cooler poking up through the tail unit. Rolf has moved the electrical system around and relocated the dashboard, but despite that training course, has wisely left the core of the power unit alone. On the mechanical front, he’s lowered the C evolution, taking out the shock absorbers to make it fully rigid. He’s also installed a slick tire at the back and stub handlebars from LSL at the front, because this scoot is heading straight for the ‘StarrWars’ drag strip at the next Glemseck 101 festival. There will be some very serious machines lining up on the strip at Glemseck, so it’ll be fascinating to see how Rolf’s C evolution fares. Will it be a match for turbos and nitrous oxide? 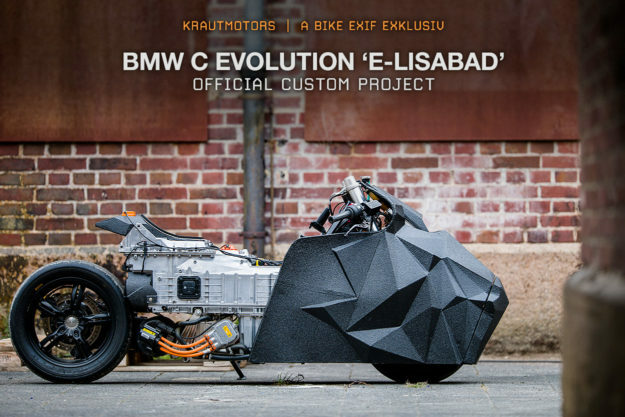 If it is, then ‘E-LisaBad’ could kick start—or should that be jolt?—a revolution in the high performance custom scene.